LatAm-Threads: What Will Happen in Colombia after Peace with Las FARC? What Will Happen in Colombia after Peace with Las FARC? Since November peace negotiations between President Santos' administration and the FARC have begun in Cuba, much to the regret of hardliner and former president Álvaro Uribe Velez and the Uribistas. Thanks to the Norwegian government who has made considerable efforts in silent diplomacy to bring the two parties to the negotiation table, define the agenda and the road-map. Meanwhile in Colombia, Uribe continues to criticize the peace process, stating that you don't negotiate with terrorists and that the current administration shows more interest in dialogue with "terrorism" than National security. After a period of ignoring Uribe, Juan Manuel Santos has started a first offense to silence Uribe and his followers by stating Uribe sought peace talks with the FARC himself for five years during his two terms. Most warfare experts will agree that any military victory isn't possible between FARC and the Colombian army. The FARC could go on for decades with their guerrilla warfare, while the Colombian army will never be able to defeat them completely in the Colombian rural areas and jungle. Unless the FARC is able to build an army as powerful and well equipped as the Colombian army, there is no chance of winning the conflict by the FARC either. 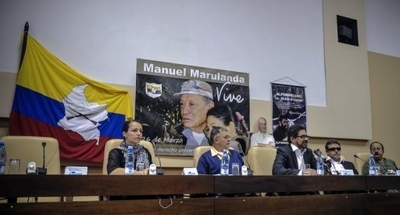 During the Uribe administration and the first two years of Santos' first term, the FARC has decreased considerably until about 8,000 combatants, according to the Colombian government. Stakes are high and the time is right. Santos needs the peace for his re-election (June 2014) and the FARC wants to campaign and to take part in the same elections and certainly doesn't want to continue peace negotiations after the elections with a new conservative president. As agenda point 1, this is probably the most important issue for both parties. The operating rules (no. 9) which are attached to the agreed agenda tell us that this is the agreed starting point. Improving the living conditions for the poor campesinos is key for solving the domestic conflict. Health, education, housing, infrastructure, cooperatives, subsidies, credits, property formalization, development programs, it will all be discussed in Havana. However what is missing here is the word "land-reform". Meaning that the properties of large land-owners (that were often stolen or bought with criminal monies in the past) will stay untouched. What is mentioned in this agenda point is the use of waste lands, which are abundantly available in Colombia, but which are less fertile than the already cultivated lands. Santos already had some social plans and initiatives to reduce poverty and plans to improve infrastructure. So what's on the agenda isn't completely a surprise. However many poor and campesinos feel not represented by the FARC and they were initially not invited to the negotiation table. Therefore FARC and government delegations announced their first accord that was reached in Havana to create a citizen participation forum on agricultural development (un foro Política de Desarrollo Agrario Integral - Enfoque Territorial) due to meet in Bogota December 17-19. Colombia's history of political participation of armed rebel groups has not been successful at all. The last time the FARC did disarm in 1985, a section of them formed the UP, Unión Patriótica, to run for office. The 5,000 UP members, including two presidential candidates, were slaughtered by drug lords, paramilitaries and rogue military agents during the mid-1980s, leading to its eventual decline and virtual disappearance. M-19 (Movimiento 19 de Abril) another rebel group that was demobilized after peace talks in the late 1980s, became a political party Alianza Democrática M-19, whose political leaders and presidential candidates were promptly assassinated by paramilitaries and drug cartels. This time it is expected that the FARC would ally itself with the existing political party Marcha Patriotica. As a prelude, a MP-party leader was assassinated on November 10th this year by apparently paramilitaries. The FARC is probably not going to lay down its arms until it gets some solid guarantees of legal protection of peaceful politicians. But how to protect yourself from paramilitary death squads? Agenda point 3 mentions quite a few difficult (FARC) issues. Therefore it may be the most difficult one to negotiate. It mentions revisions of all FARC guerrilleros (charged or convicted) and guarantees of security. Security guarantees will be very difficult to realize. Too many actors in Colombia would like to extinguish all FARC leaders and commanders. The FARC's only 100% safe haven would be for instance Cuba. At the same time the FARC wants the government to intensify the combat against BACRIMs (paramilitaries). The intensifying is not qualified or quantified in the agenda, but because BACRIMs still have relations with the oligarchy it's obvious the FARC wants them eliminated. The past shows that this has been always very difficult because of the complexity of the Colombian armed conflict. The paramilitaries do exist as long as the FARC and have always been connected to and protected by the oligarchy. On top of that the government is asked to intensify the battle against corruption and impunity. These are all very difficult tasks, that probably would take 15-20 years to establish significant results, if not sabotaged by successive governments. A very small agenda point with few items. My expectation is that it will not be much discussed. Remarkable is that this point doesn't mention regulation and legalization of cocaine cultivation and consumption as president Santos was suggesting to OAS members at the the Sixth Summit of the Americas that was held in Cartagena on April 14-15, 2012. The agenda mentions finding a "solution to the phenomenon of production, consumption and public health". The other issue on the agenda is Illicit crop substitution programs. Until present most of those substitution programs have not been very effective because of the less fertility of the soil and the lack of infrastructure to bring harvests to market. Agenda point 5 is also very small with few items. It addresses the compensation of the victims, their human rights and truth finding. In the past Colombian governments have done very little about truth finding regarding the conflict. It wasn't strategically smart because it would interfere with disinformation campaigns and warfare strategies. Naturally, truth commissions can only function after a conflict has ended and the Colombian conflict hasn't ended yet. After the demobilization efforts of the AUC paramilitary organization in 2005, a process of confessions in exchange for sentencing benefits was implemented, but failed. Thousands of individuals going through the demobilization ceremonies were simply asked to answer a handful of irrelevant questions by prosecutors. The compensation of victims will be another challenge. Law 1448 Ley de Víctimas y Restitución de Tierras 2011 (Victims and Land Restitution) was enacted January 1st 2012. The law has many shortcomings and was weakened during Santos' term. The law hasn't been very effective yet and already led to increased violence against representatives of groups that have made claims on stolen land (already 25 leaders killed). Most IDP's (Internally Displaced Persons) still live in urban slums and had to adapt their lifestyle. It's not very likely they want or even can return to their original farmland. It's also hard to proof you're a victim of land grabbing. The official IDP counts are much lower than the counts of Human Rights Organizations. Last but not least the land grab and displacement still continues, 2011 counts 100,000 new (official) IDP's, 2012 will be about the same. And how do you prove your husband was killed by the military, rebels or paramilitaries when there is no corpse and/or witnesses? Agenda point 6 indicates quite some tough issues too. How to provide the proposed Commissions of tracking and verification with sufficient powers to guard the agreed conditions of peace? Long term International support and supervision seems inevitable, because almost all legislation, amendments and decrees regarding the Colombian conflict seemed to be badly implemented, enforced or weakened. Legislative power in Colombia is vested in both the government and the two chambers of congress, the Senate and the House of Representatives of Colombia. President Santos' government coalition is formed by his own political party Partido Social de Unidad Nacional (47 seats), Partido Conservador Colombiano (38 seats), Partido Liberal Colombiano (37 seats) and Cambio Radical (15 seats. All together 137 out of 166 seats of the House of Representatives. However, the Uribista factions of the coalition's political parties would probably oppose new legislation as a result of the peace talks, which could jeopardize Santos' majority in congress and may even break up the coalition. 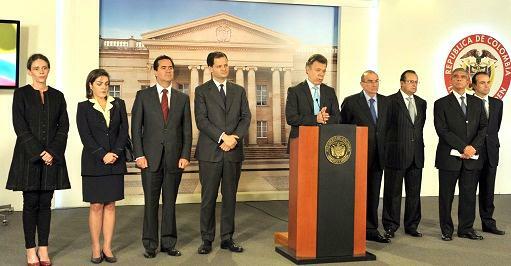 Colombia has been a State Party to the International Criminal Court since 5 August 2002. The ICC has jurisdiction over crimes against humanity and genocide committed on the territory of Colombia or by its nationals since 1 November 2002 and for war crimes from 1 November 2009 onwards. The ICC's Office of The Prosecutor (OTP) is monitoring the situation in Colombia closely. Its latest report could be found here and the OTP will certainly act if Colombian perpetrators of the crimes mentioned above are not tried in court. It is not unthinkable that even Álvaro Uribe will be tried by the ICC for his part in the "falsos positivos" case. 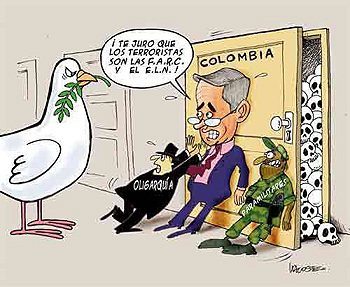 Álvaro Uribe:"I swear that the FARC and ELN are the terrorists!" What will happen after the peace talks turn out to be successful? I hope I am wrong here, but I think the violence in the rural areas of Colombia will significantly increase. BACRIMs will violently and quickly take over the coca cultivation and cocaine production in the former FARC controlled areas. BACRIMs will concur each other and the campesinos will be the in-betweens, the assassinated or the extorted. A similar scenario has been seen before after several forced retreats of the FARC. As long as the North-American market demands cocaine at high prices, the Colombian conflict will be fueled with abundant monies. The BACRIMs in the rural areas of Colombia are as tough to combat as the guerrilleros. The battle against the BACRIMs will be very difficult because it is not one single organized group, but many. It is like fighting cockroaches in a kitchen. They multiply at the same rate as you exterminate them, because there is plenty of food. If the peace talks fail, violence will increase too. The FARC will probably invade the cities again, restart bombing and take hostages. We will probably be back at square one. Maybe the best way out here is to agree a bilateral truce and to extend the peace talks with at least another year. The Colombian society will be able to get used to the absence of FARC/Army violence which, could benefit the peace process in a positive way for both parties. Plans could be worked out better with more International support. It could be wise to agree to leave most of the guerrilleros just where they are and turn them into Policemen. If not, the ex-guerrilleros could become ACRIMs. This has happened before, when over 2,500 fighters from the Popular Liberation Army (EPL) demobilized in 1991. Many former EPL fighters later enlisted with the AUC paramilitaries before becoming leading figures in the BACRIM and, even today, ex-EPL fighters dominate the criminal landscape. In the mean time try to replace coca by another viable cash-crop for the campesinos, because the ex-FARC-members will not enforce coca eradication policies if there isn't another cash-crop available for the campesinos to grow, or roads to transport their products to the local market.